"Went to church and fasted all day. 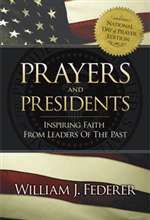 "-GEORGE WASHINGTON, Diary Entry, June 1, 1774, day British blockaded Boston's harbor From George Washington's orders for troops to attend divine services, to Abraham Lincoln's annual day of thanksgiving, to Harry S Truman's annual day of prayer, America's leaders of the past have a tradition of faith, especially in times of crises! There is a chapter on every President of the past, from George Washington through George W. Bush, with excerpts from Proclamations, Addresses to Congress, Executive Orders, Personal Correspondence and Memoirs. "Appealing to the Supreme Judge of the world for the rectitude of our intentions..."-THOMAS JEFFERSON, Declaration of Independence, July 4, 1776 "That the citizens of these States, abstaining on that day from their customary worldly occupations...acknowledge before God the manifold sins and transgressions...as individuals and as a nation, beseeching Him...through the Redeemer of the World, freely to remit all our offenses, and to incline us by His Holy Spirit to that sincere repentance and reformation. "-JOHN ADAMS, Day of Fasting declared during a threatened war with France, March 23, 1798 "In the present time of public calamity and war a day may be recommended to be observed by the people of the United States as a day of...humble adoration to the Great Sovereign of the Universe, of confessing their sins and transgressions, and of strengthening their vows of repentance. "-JAMES MADISON, Day of Fasting, November 16, 1814, after British burned the Capital "In a time of war humbly and devoutly to acknowledge our dependence on Almighty God and to implore His aid and protection...I, Woodrow Wilson, President of the United States of America, do hereby...exhort my fellow-citizens...to pray Almighty God that He may forgive our sins. "-WOODROW WILSON, Day of Fasting May 11, 1918, during World War I "Almighty God: Our sons, pride of our nation, this day have set upon a mighty endeavor, a struggle to preserve our Republic, our religion and our civilization...Help us, Almighty God, to rededicate ourselves in renewed faith in Thee in this hour of great sacrifice. "-FRANKLIN D. ROOSEVELT, June 6, 1944, D-Day Prayer on Allied Invasion of Normandy, France "America needs God more than God needs America. If we ever forget that we are One Nation Under God, then we will be a Nation gone under. "-RONALD REAGAN, August 23, 1984, at Ecumenical Prayer Breakfast, Dallas, Texas A great source of inspiration for any student of history, you will be uplifted and challenged by reading, "Prayers & Presidents-Inspiring Faith from Leaders of the Past."